During a recent visit to Winchester, Virginia’s Handley Regional Archives room, officially the Stewart Bell Jr. Archives Room, I came across an interesting article in theConfederate Veteran magazine [vol. 27, p. 125] that connected a Confederate officer from a prominent Winchester family with his son who posthumously received the Distinguished Service Cross for “extraordinary heroism in action near Samogneux, France” on October 8, 1918, barely a month before the armistice was signed. This move inspired the rest of the gray cavalrymen who galloped into the fray. Somehow Conrad emerged unscathed – still carrying the cavalry guide-on. Rosser credited Conrad with “giving me a great victory.” Holmes Conrad’s father was Robert Young Conrad who had served as a delegate to both Virginia secession conventions held in February and April 1861. Fast forward now more than fifty years. 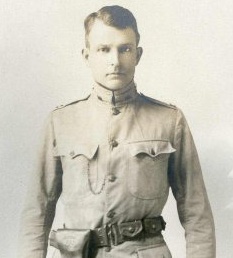 Holmes Conrad’s son, Captain Robert Young Conrad, commanded a company in the 2nd Virginia Infantry Regiment pulling guard duty on the Mexican border near Brownsville, Texas in 1916. This Virginia National Guard unit traced its roots to the famous Shenandoah Valley regiment that served in the Stonewall Brigade during the War Between the States. 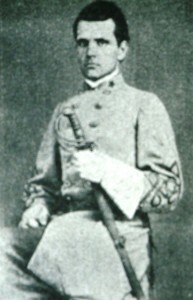 The younger Conrad, like his father, had impeccable Old Dominion education ties: a VMI diploma and a law degree from the University of Virginia. Captain Conrad’s company returned to Virginia in early 1917 only to be issued orders for Federal military service weeks later. Conrad and his men became part of the 116th Infantry Regiment assigned to the 29th Infantry Division, the Blue and Gray Division. After additional training, the unit prepared to sail for France in June 1918. The thirty-four-year-old said his good-byes to his pregnant wife. Little did they know that he had only a few months left to live. On October 8, 1918, Captain Conrad, perhaps inspired by the Confederate bravery of his father who had died only a year earlier, led a charge out of the trenches near Samogneux, France toward an enemy position on Malbrouck Hill. They met initial success capturing numerous prisoners and their weapons. As Conrad rushed forward with his Virginians toward the next German trench they ran into a wall of machine gun-fire. Conrad went down with a head wound and he died the next day never regaining consciousness. He was buried at the Meuse-Argonne American Cemetery in Romagne, France. More than 300 members of the 116th Infantry died on French soil during the war, but Captain Conrad was the highest ranking Virginia National Guardsman to fall.